Originally founded in 1908 as the Northwestern University School of Commerce part-time evening program, the J.L. Kellogg Graduate School of Management was a founding member of the American Assembly of Collegiate Schools of Business. In 1966, the school disbanded its well-regarded undergraduate business program. This change allowed for a greater focus on graduate education and a more research-oriented faculty. The school was renamed the J.L. Kellogg Graduate School of Management in 1979 after a $10 million gift from John L. Kellogg, former president of the food manufacturing Kellogg Company. The Kellogg School has campuses in Evanston, Chicago proper, and Miami as well as a slew of Executive MBA Global Campuses. Most Kellogg students live in Evanston, on the western shores of Lake Michigan, which is easily accessible to Chicago by public transit. In early 2017 Kellogg completed its new Global Hub flagship building. 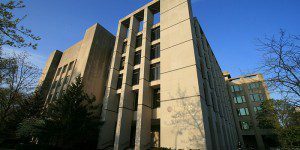 The building houses Kellogg, and Northwestern Weinberg College of Arts and Sciences economics department. Inside the building are flexible classrooms that convert from tiered seating to flat, the two-story White Auditorium, and the Galvin Family Design Wing and Conference Center, which houses four design studios and gives students a center for hands-on learning. Kellogg’s Chicago campus occupies a 20-acre lakefront area on the north side of the nation’s second largest financial center. This location hosts the part-time MBA program. The campus borders Chicago’s business and financial center and is also the home of the Northwestern’s School of Law, School of Continuing Studies, Medical School, and the McGaw Medical Center. The Miami Campus is located in Coral Gables, Florida in a hotel, just a short walk away from the Miracle Mile, the area’s main commercial street. Coconut Grove and Miami’s South Beach are also conveniently close by. On the Evanston campus, the full-time MBA Program is housed in The Global Hub. The Executive MBA Program is located in the James L. Allen Center at the heart of the Evanston campus on the western shores of Lake Michigan. This building hosts more than 5,000 executives each year and is designed and managed exclusively for Kellogg’s executive management programs. The part-time MBA is housed in historic Wieboldt Hall at 340 East Superior Street, in Chicago. This facility has 17 classrooms, 20 group study spaces, faculty and administrative offices, a business library, computer lab, and a newly renovated café. Kellogg has over 300 full-time and part-time professors. There are nearly 500 students enrolled in the most recent Kellogg School of Management full-time program. Kellogg offers One-Year and Two-Year full-time, part-time, and Executive MBA programs.